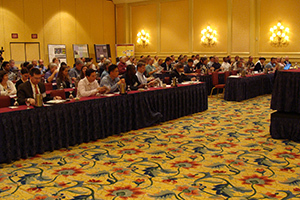 From its inception through 2012, NGI hosted an annual conference that brought together regional scientists, researchers, educators, and students with NOAA and other stakeholders in the northern Gulf region to strengthen and grow regional relationships, collaboration, and scientific knowledge. The conference highlighted NGI-funded research by multi-university teams and partners and included student-focused events such as poster contests and interactive discussions at the NOAA Career Roundtable. After the Deepwater Horizon oil spill, NGI joined with many other stakeholders in the region to establish the Gulf of Mexico Oil Spill & Ecosystem Science (GoMOSES) Conference and have advocated it as an appropriate dissemination venue as an outgrowth of the NGI annual conference.